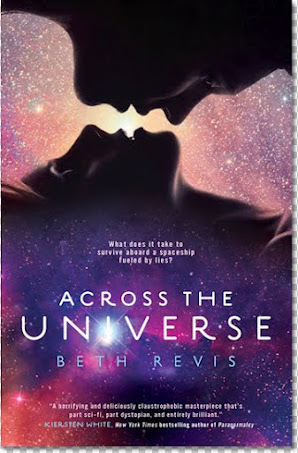 Across the Universe [Book Review] – my books. my life. Prior to boarding the spaceship Godspeed, Amy and her parents are cryogenically frozen. They are to be reanimated in 300 years when the ship arrives at Centauri-Earth. But someone wakes Amy up early. She befriends Elder, the future leader of the ship. When the two try to figure out who is killing the other “frozens,” they find themselves uncovering lies older than they could have imagined. The ship is scheduled to take 300 years to travel to the new planet. There are people living on the ship. People are progressing, inventing things, and changing government structures. Are scientists and leaders who were frozen 300 years before really going to be helpful when they land? That would be like us using Louis XIV, Adam Smith, or Edward Jenner to make our political, economic, and scientific decisions. People die in their 60s. The generation that is in their 20s is supposed to land on the planet in 49 years. Um. Amy runs a 12 minute mile and she wants to WIN the NYC marathon? Really? But despite these logical flaws, I still adored this book. Which should tell you that I REALLY liked it: so much so that I am willing to ignore logic. And I hate ignoring logic. That’s all you really need to know. If a 12 minute mile is the winning time for a marathon, I’m thinking I’m looking pretty good! Ha! Well, I have this book (got it at SIBA two years ago I think) but have yet to start it. People have really liked it (not so much the sequel it seems) so I should give it a go. I really enjoyed Across the Universe as well as the sequel. Revis’ writing was enough for me to forgive some flaws. I have this one and the sequel, and I haven’t gotten to them yet. I think a lot of people really loved this book, and that makes me hopeful and eager to start with it. I love it when a book is so good that it makes you suspend disbelief. This was just an entertaining read for me. I had problems with the “mystery” aspect. I wanted more space and less mystery. I read this last year when it was released and did the same with A Million Suns. I love both. There should be at least one more next year and I’m already excited for it!!! my thing was…. after being frozen for 250 years, she could still run without much of a problem. SHE WAS FROZEN. that’s gonna have some detrimental effects on her long unused muscles. however, i still enjoyed the heck out of this book. a million suns was even better! Pingback: A Million Suns [Book Review] | my books. my life. A tiger smile before a series of meltdowns, with the last being because we left at the time we told him we were leaving before the party started. Poor kid is so tired and squeezing in this birthday party for Kai’s friend (Happy Birthday, Zeke!) was probably too much. We just left him with a babysitter who will probably never be back after tonight. BUT it was great to see the old preschool crew and visit with all the families we spent so many weekends and lunchtime Shabbats with. I’m happy we moved Kai this year but we don’t have anything like that at the elementary school and I miss it. Parenting is so exhausting. My community day buddy today.